ORGANIC SPA GIFT BASKET ❤ Nothing says "sweet indulgence" like a luxurious home spa session! Delight yourself or a lucky recipient to this spectacular ORGANIC Bath Gift Set, beautifully wrapped up in a rustic-chic wooden basket. Contains 2 ORGANIC Coconut Soaps, Shower Gel(200ml), Bubble Bath(200ml), Body Lotion(200ml), Organic Unrefined Shea Butter(50ml), Massage Oil, 6 Bath Bombs, Plush Towel, Exfoliating Loofah Back Scrubber and a Brown Wooden Crate for décor and storage. SAFE, NATURAL INGREDIENTS ❤ The more we learn about skincare, the more we realize the importance of safe, natural formulas. That's why the luxury bath accessories in this body gift set were formulated with ORGANIC COCONUT OIL and 100% pure ingredients. Good to the core, each product will nurture and protect the health of your skin. COMPLETE SPA GIFT SET ❤ Restore your equanimity with a luxurious at-home spa treatment! 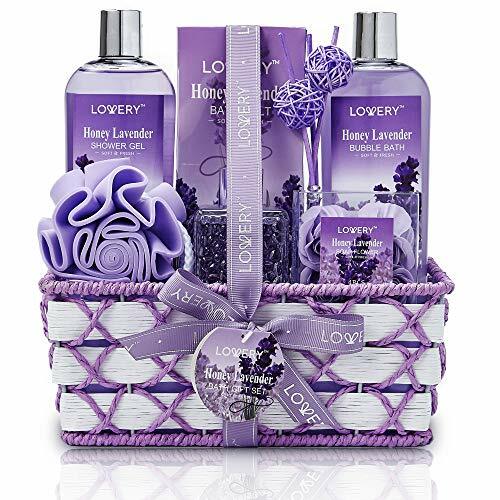 Beautifully packaged in a charming woven basket, this bath gift set makes for an extraordinary gift, and adds a lovely touch to the bathroom. 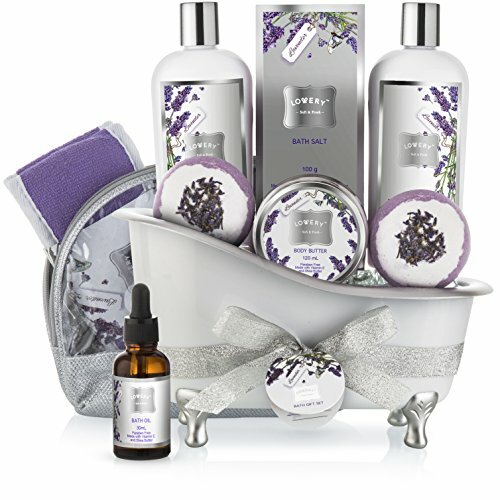 Contains a Shower Gel(180ml), Bubble Bath(180ml), Body Lotion(100ml), Bath Salt(100g), Body Scrub(50g), Lavender Massage Bath Oil(30g), Exfoliating Loofah Back Scrubber and a Purple Handmade Weaved Basket for décor and storage. LAVENDER & JASMINE FRAGRANCE ❤ Lavender's rich herbal aroma blends with Jasmine's soft floral notes to form a soothing, addictive fragrance. Let your troubles unravel as you enjoy a hot soak in the tub! The sedative properties of lavender induce calmness and relaxation, while these lush bath products cleanse and hydrate skin. There's no better way to wind down for a sleepy night! GREAT FOR YOUR SKIN ❤ Why waste money on chemical-laden skincare that may harm your body and the environment? These luxury bath accessories are PARABEN-FREE and NEVER TESTED ON ANIMALS. In addition, they're made with SHEA BUTTER & VITAMIN E to soothe, moisturize and protect your skin. All ingredients used in this spa basket are carefully sourced and clearly displayed for your benefit. COMPLETE SPA GIFT SET ❤ Melt into serenity with a luxurious at-home spa treatment! Beautifully packaged in a stylish silver basket, this bath gift set makes for an extraordinary gift, and adds a lovely touch to the bathroom. Contains a Shower Gel(160ml), Bubble Bath(160ml), Body Lotion(60ml), Bath Salt(100g), Body Scrub(50ml), 2 Ducky Soap Bars, Exfoliating Loofah Back Scrubber and a Silver Shimmery Weaved Basket for decor and storage. OCEAN BLISS FRAGRANCE ❤ Feel the desperate need for a retreat? Open and inhale these luxurious bottles for an instant vision of the deep blue, with salty waves cascading and crashing onto the coast. The breezy, aquatic notes in this euphoric fragrance will awaken your senses as you soak away the stress. You'll emerge with body and soul revived! COMPLETE SPA GIFT SET ✿ Indulge your senses with a luxurious at-home spa treatment! 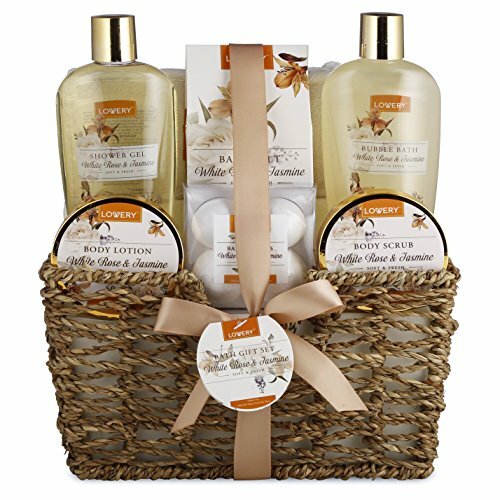 Beautifully packaged in an elegant woven basket, this bath gift set makes for an extraordinary gift, and adds a lovely touch to the bathroom. Contains a Shower Gel(240ml), Bubble Bath(240ml), Body Lotion(120ml), Bath Salt(100g), Bath Bomb(70g) Flower Shaped Bath Puff and Handmade Weaved Basket for decor or storage. HONEY & ALMOND SCENT ✿ The sweet, nutty fragrance of Honey & Almond will carry you away into sudsy paradise! This delicious fragrance is infused with rich, buttery notes and conjures the image of a warm baked treat on a snowy day. Let your body soak up the goodness while you pamper your skin with the finest bath products. THE IDEAL HOLIDAY GIFT IDEA ✿ Find the way to your woman's heart & delight her with something truly special when presenting this gift of sheer indulgence! Personalize it with a thoughtful written message on the enclosed gift note to win the heart of your Girlfriend, Wife, Mom, Sister, or Friend. 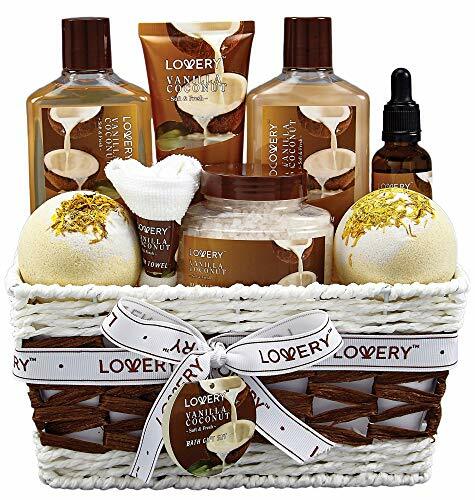 What better way to celebrate Birthdays, Anniversaries, Christmas, Mother's Day,Easter Day & Thanksgiving with the ultimate beauty spa gift basket, Armed with our array of lavish bath accessories! 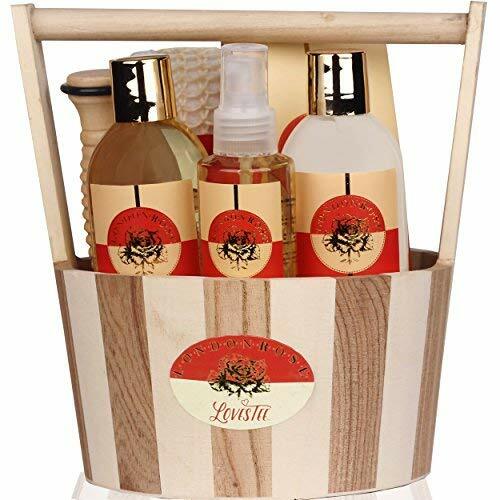 DELUXE 9 PIECE SET ♥ This spa gift basket has everything a woman needs! It includes Shower Gel, Bubble Bath, Body Scrub, Body Oil, 2 Large Bath Bombs, Bath Salt and a luxurious Bath Towel. Packed in a stunningly wrapped in a handmade basket, it also has a gift note card for you to personalize it. PREMIUM QUALITY INGREDIENTS ♥ Every Lovery product is 100% Paraben and Cruelty-Free. These enriching beauty products are made with moisturizing Shea Butter and nourishing Vitamin E. They are safe even on sensitive skin! We're confident you'll fall in love with our beauty set, we've backed it with a 100% money back satisfaction guarantee. DELUXE 13 PIECE SET ♥ This spa gift basket has everything a woman needs! It includes Shower Gel, Bubble Bath, a Diffuser With Lavender Essential Oil, Bath Salt, 4 Soap Flowers In Their Own Case, and a Pouf. Packed in a stunningly wrapped basket, it also has a gift note card for you to personalize it. SWEET 'N SUBTLE ♥ Rich sweet notes of honey combine with the relaxing calming effects of lavender in this one of a kind set. Enjoy a spa experience in the comfort of your own home with fragrant bubble bath, stunningly elegant soap flowers and an exfoliating loofa pouf sponge. PERFECT FOR HER ♥ It's the present any girl will love! Pamper and indulge the special lady in your life with a stunningly beautiful and elegant gift package. It makes a wonderful present for Birthdays, Holidays, Anniversaries, Christmas, Mother's Day and Valentine's Day. Bring a smile to your Girlfriend, Wife, Mother or Daughter. ► THE IDEAL HOLIDAY GIFT YOUR BELOVED ONES WILL THANK YOU FOR! DRESS TO IMPRESS! This Exquisite Cologne Spa Gift set includes 6 Fragrance favorites. 1 Sensual Body Lotion 200ml, 1 Exotic shower gel 200 ml , 1 Body Mist, 1 Loofah Back Scrubber, 1 bath salt 3.5 oz. and a Wooden Massage Stick. ►Lovestee's Cologne Home Spa Kit Is the Perfect Gift for Christmas, Mother's Day, Valentine's, Birthday Gift, Anniversary for a Romantic Night Out or a Get Well Soon Package. 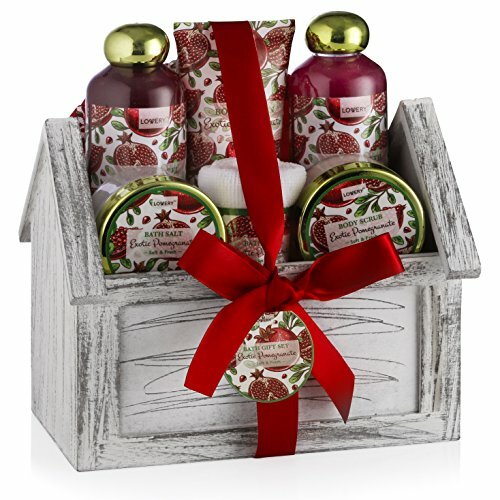 Your gift will leave a lasting impression as they continue to use and enjoy this hand crafted spa set. 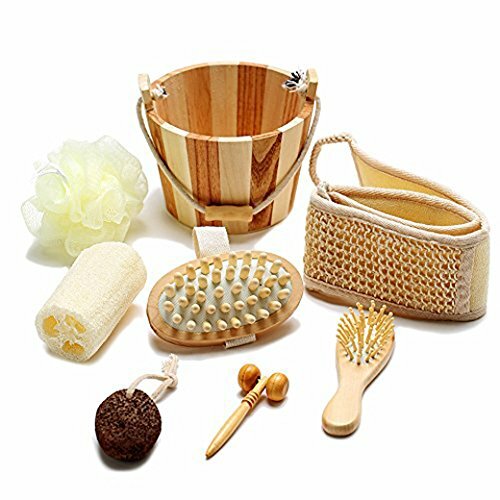 ►Spa Basket for Gifts: Best Gift Idea for Women, Mom, girls and Teens or anyone you love! 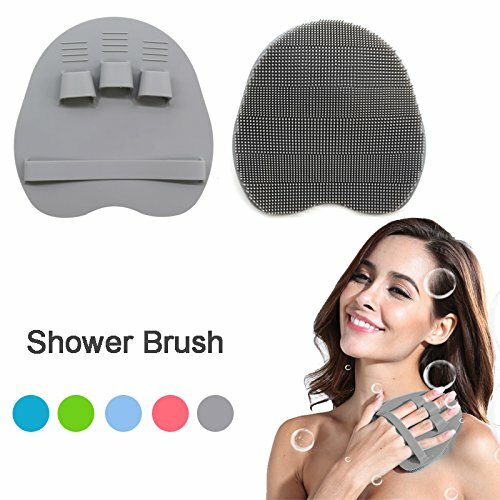 ★ The item is a pair simple and practical bath shower gloves, which is made of acrylic fibers, and can be used with your favorite liquid or soap to remove dead skin cells, stimulate blood circulation and leave your skin smooth. It is also suitable for household cleaning and scrubbing. ★ Replace traditional bath towel,easy to clean,to grasp,good for removing dirty off. Use with your favorite soap or shower gel and enjoy a pleasant shower massage. 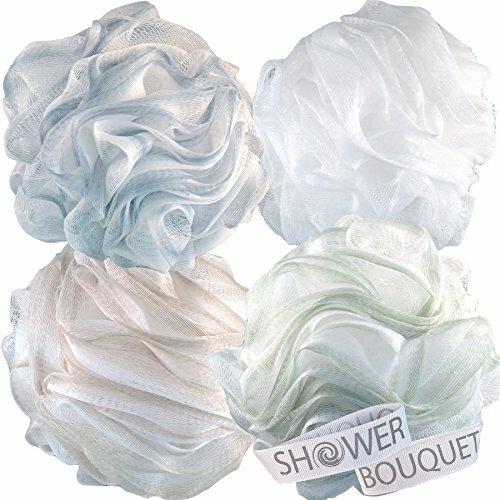 ★ Unique weave design, can help you relieve fatigue, promote blood circulation, to experience the thrill of unprecedented bath. ★ Try it ! Feel the best ever ! 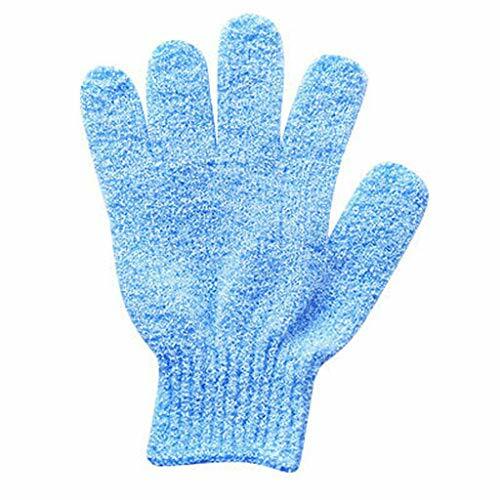 Bath Glove Shower Scrubber Back Scrub Exfoliating Body Massage Sponge Gloves. PREMIUM QUALITY: Eco-friendly and health materials, super soft, durable with excellent process. EASY STORAGE- Attached String for Easy Storage After Use! 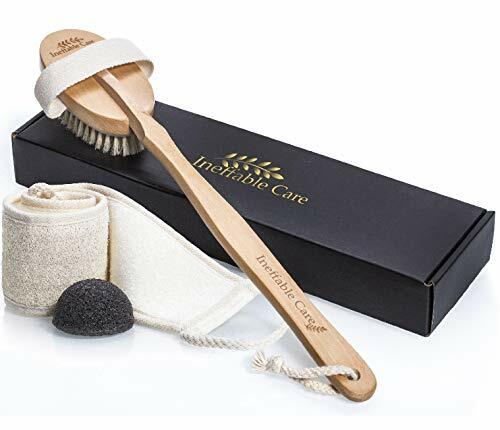 ✔BEST BODY CLEANING SET - We created the best wood handled lufa/pouf, taking bamboo charcoal fibers and meshing them into our shower sponges. 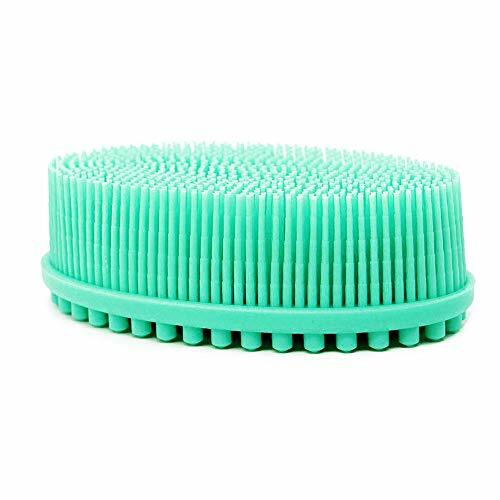 This set provides the ultimate shower scrubber experience. Use it with your favorite gel or body wash.
✔FIRM & GENTLE - Our Loofahs are the best combo set for exfoliating dead skin cells, especially, rough areas around the feet and elbows. Special fibers gently massage and cleanse even the most sensitive skin types so they won't scratch your skin. 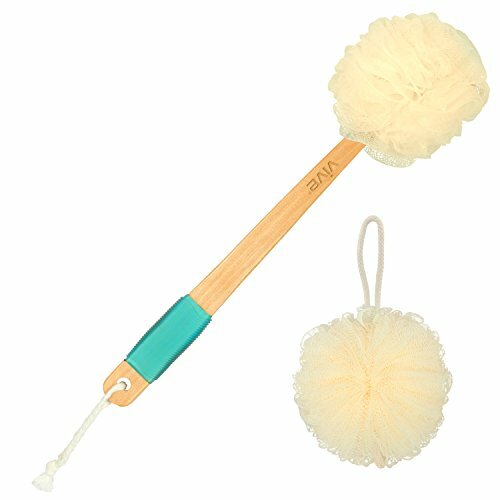 ✔EXTENDED REACH & BETTER GRIP - Our Long handled back loofah reaches 17" plus creating ease for your back and feet. More girth on the handle creates better grasp. 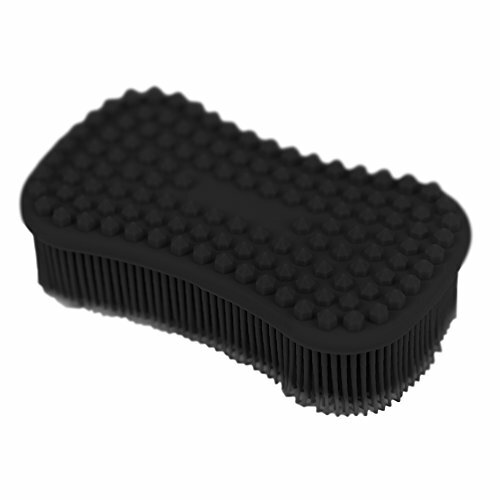 The textured rubber grip provides a comfortable and secure, no-slip grip even when wet. ✔DURABLE & MILDEW RESISTANCE: We see loofahs that mold easily. We coated ours with a clear layer. The handle is resistant to mold and mildew and won't split or crack with short use. The fibers dry quicker than a traditional loofah. 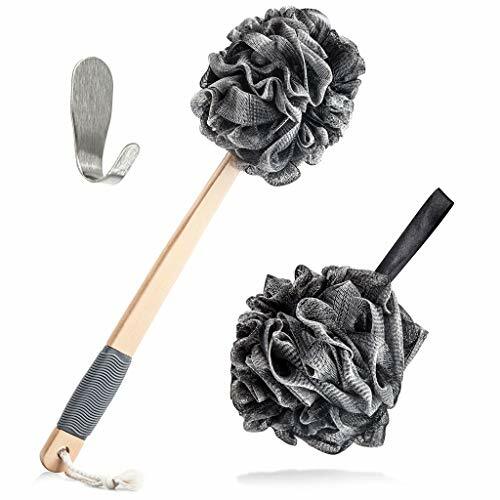 ✔GUARANTEED SATISFACTION - This loofah/sponge shower set is best in it's class. 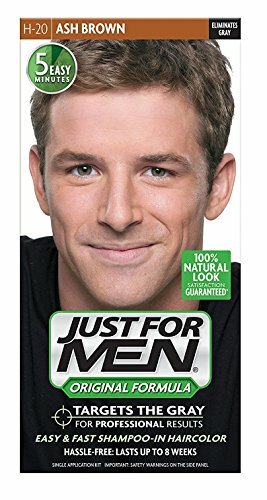 But if it isn't better than the other guys, please, send it back for a 100% refund. We won't be mad. Promise. 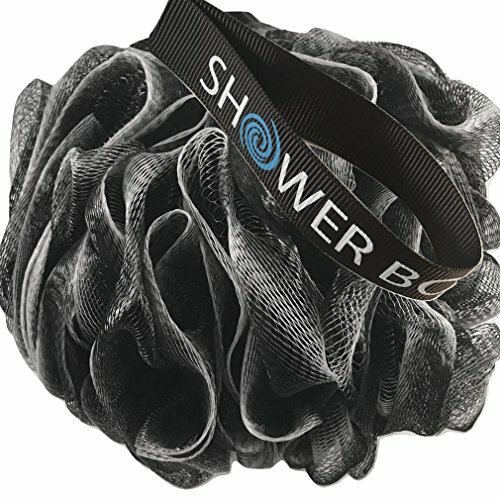 Environmental Friendly:Eco-friendly carbonized bamboo and avirulent insipidity PE material (No other synthetic).Bamboo charcoal loofah-Effectively exfoliating texture,remove dirt and wash away excess grease. Enjoy shower time:It takes just a few minutes in the shower and can help make your skin smooth and silky soft.Work with shower gel,Easily loosen and remove the top layer of dead skin cells and remove excess grease. Feature:Great size with long handle.Easy to use and hang-perfectly fit your bathroom hangers or door hook.5.1 inches in width with 60 grams. Function:Exfoliate,cleanse,soothe skin,detoxify and balance the skin pH.The soft bath sponges work up lather with shower gel or soap to help you exfoliates and cleanses skin pores. Greast Gift for Family: Our eco-friendly and health loofahs in 4 is the best choice for you to shop as a present for your family and friends.Fit for Christmas,Mothers Day,Baby Shower or Birthday etc. &#x1F6C0; Each Loofah sponge measures 5-Inches in Length. Diameter varies as this is a natural product. 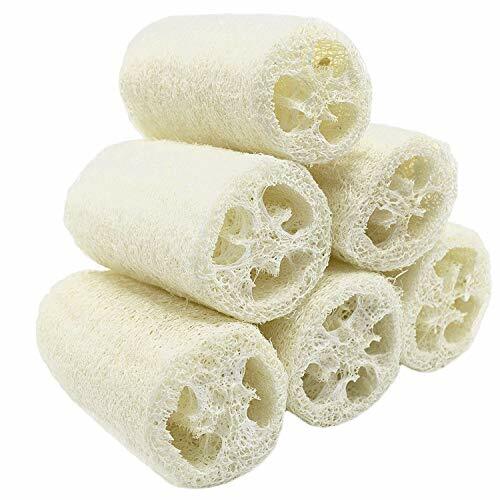 &#x1F6C0; Higher Quality, Lower Price: We worked with many experts to create a Loofah Sponge that will leave your skin glowing while taking away the chance of irritating your skin! &#x1F6D1; Once received, please soak in warm water for about 20 minutes to make it soft before the first use. After using, please clean with water and have it air dried. This will extend the lifespan of the item. ⭐ Guarantee - We want you to love this. If you are not 100% satisfied, please return for a 100% hassle free refund, even used. With that, you have no risk, add one to your cart now! 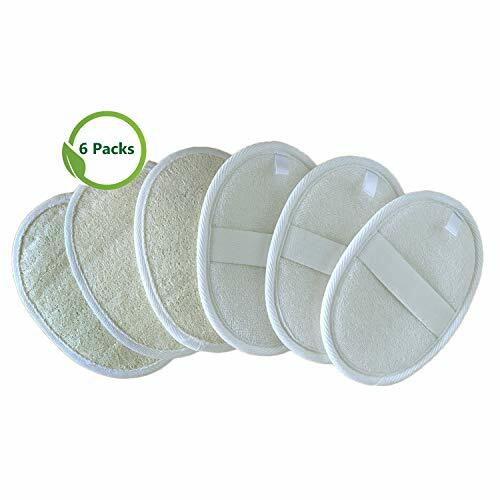 100% NATURAL MATERIALS:- The loofah pads are made of 100% natural loofah sponge and terry cloth materials which are non-toxic, skin-friendly, hypoallergenic and antibacterial. DEEP CLEANING YOUR SKIN:- With natural and porous vegetable fiber, the luffa pads gently deep cleanse your skin, remove horniness, clear acne & blackheads and leave your skin feeling silky smooth. 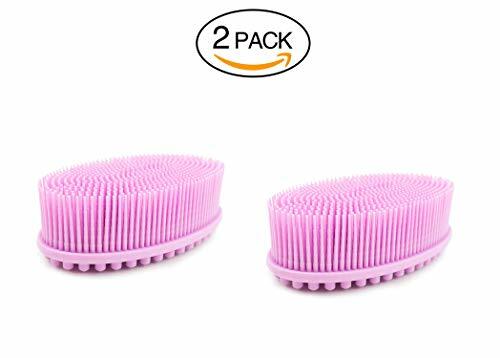 EASY TO USE:- The items have a nice shape and size with a elastic hand strap and terry cloth backing designed to ensure the loofah pad stays in your hand for all over body scrubbing. HOW TO USE:- Before bath spa and shower, soak in water to become soft and dry in the air after using, better to renew replacement every four weeks like towel. 100% MONEY BACK GUARANTEE:-If you are not satisfied for any reason, simply return your product for a full refund. You have nothing to lose. MAYMII·HOME BRAND RIGHTS OWNER IN LOOFAH PRODUCT：Any infringement will be reported to Amazon immediately. 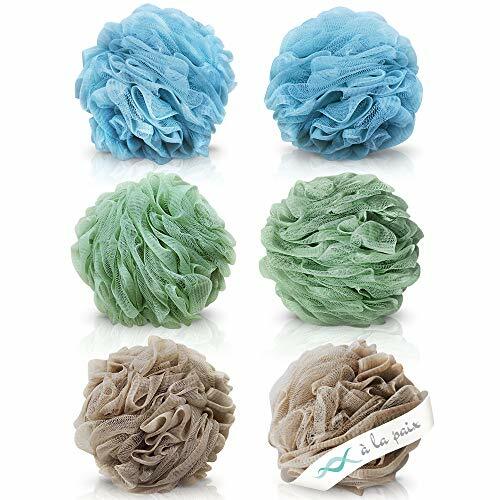 Buyer Beware:For easy transport and easy storage, these loofahs are flat and you need to soak them in water for 2 minutes and they will turn round.And Soak in hot water 20 minutes to let it soft. 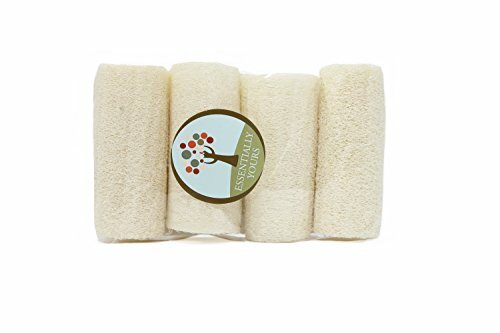 Material: 100% Organic Natural Nature Loofah helps slough away dry, rough skin Natural loofah interior fibrous, The loofah sponge comes hard and tough, so for the first time use, please dip it in warm water for about 20 minutes to make it soft. 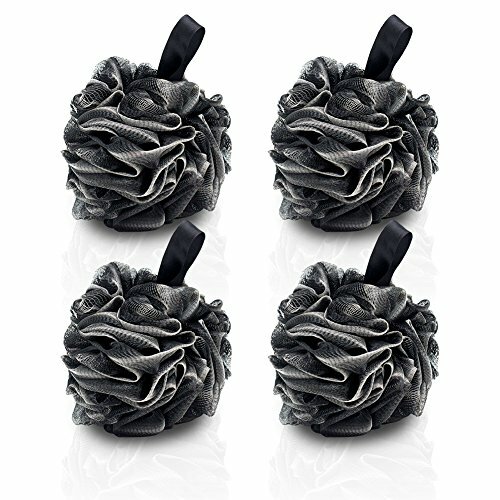 Set of 3 Egyptian Natural loofah. Approximate Size is 6x6 inch (15x15cm). It is shipped commpressed flat. Just soak it in hot water for 15 min and it will retain it original shape. Natural Benefits - Give your skin the natural glow and radiance that you have always wanted by regularly exfoliating the natural way. By removing dead and dry skin you will be able to look your best all day long. 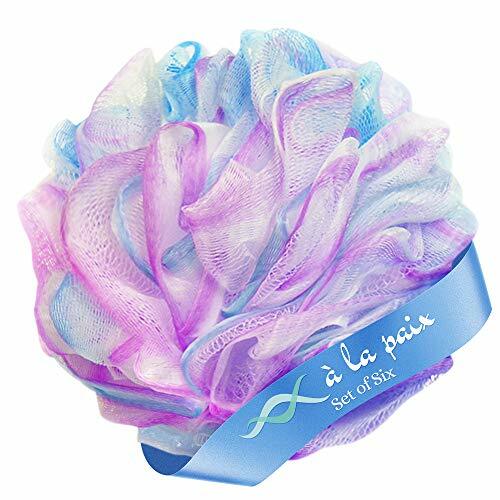 Egyptian Quality - Unauthentic loofas that are marketed as 'Chinese Loofahs' claim to have extremely long lifetimes but they are actually prone to irritating your skin. They also require a breaking in period before any benefit it seen. By always looking for a mark of quality, your choice to go Egyptian ensures you the natural touch from day one. A Touch of Luxury For Your Skin - Regular Loofah use also boosts the circulation to your skin to ensure that you are positively radiant like never before. The Treatment You Deserve - Loofahs that routinely fall apart or irritate your delicate skin are cheap alternatives to our guaranteed luxury product. By searching the world for the finest products it has to offer we are proud to put our name to the leading natural skincare product on the market. 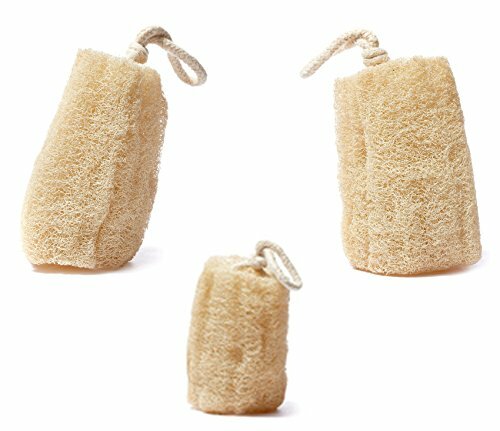 Set of 3 Egyptian Loofah 100% Natural SPA Beauty Bath Sponge Body Puff Scrubber. COMPLETE SPA GIFT SET ✿ Rejuvenate mind and body with a luxurious at-home spa treatment! Beautifully packaged in a rustic wooden crate, this bath gift set makes for an extraordinary gift, and adds a lovely touch to the bathroom. Contains a Shower Gel(150ml), Bubble Bath(150ml), Body Lotion(80ml), Bath Salt(50g), Body Scrub(50g), Plush Towel, Spacious Cosmetic Bag and Wooden Crate for decor or storage. EXOTIC POMEGRANATE FRAGRANCE ✿ Warm, fruity notes highlight the incredible scent of Exotic Pomegranate. Our sweet and sultry bouquet will take you far away... and bring you back feeling exhilarated and ready to conquer the world! Pamper and envelope your body with this irresistible fragrance, as you soak and scrub your way to baby-soft skin. COMPLETE SPA GIFT SET ❤ Soothe and diffuse stress with a luxurious at-home spa treatment! 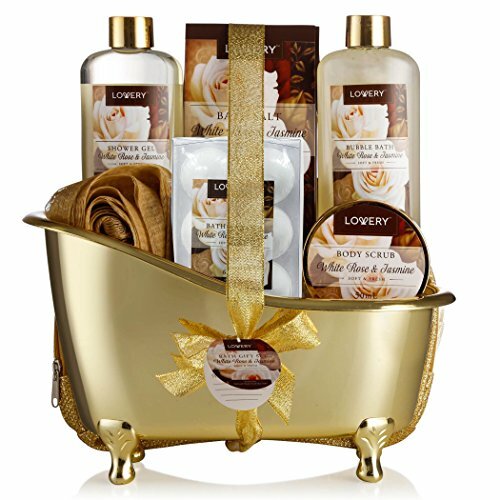 Beautifully packaged bath basket in a vintage gold tub, this bath gift set makes for an extraordinary gift, and adds a lovely touch to the bathroom. Contains a Shower GeL(180ml), Bubble Bath(180ml), Body Scrub(50ml), Bath Salt(100g), 6 Bath Bombs, Rose Shaped Bath Pouf Sponge, Spacious Carry Cosmetic Bag and Gold Tub to play, storage or décor. WHITE ROSE & JASMINE FRAGRANCE ❤ The calming scent of White Rose & Jasmine will gently ease you into a state of peace and well-being. Feel your troubles fade as you soak, scrub and slather your way to silky-smooth skin. This elegant fragrance is infused with warm, floral notes and perfectly balanced, for a treat to your senses that'll last all day. 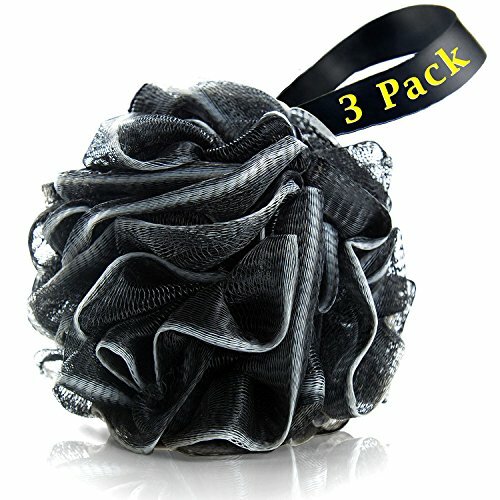 Our 3 pack of shower loofah comes in a balck color, 1 of each shown, it is fit for everyone! Be it Mothers Day, Valentines Day, a Baby Shower or Birthday, she (or he) will love! 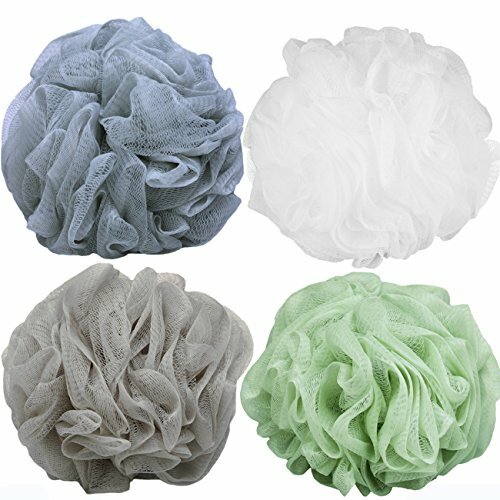 Material: made of 100% natural loofah and terry cloth material which is non-toxic, skin-friendly, hypoallergenic and antibacterial. Multi-function: remove horniness to give you smooth skin every day; promote cell metabolism to make your skin more tender; dredge the meridians to promote blood circulation. 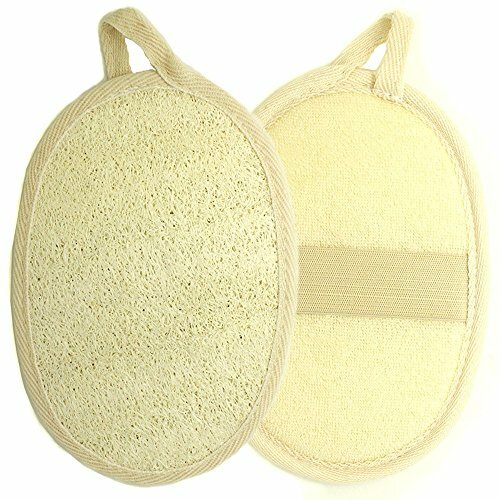 Usage: loofah sponge pad can be used when bath shower and spa. 3.9*5.9 inches fits most of people. 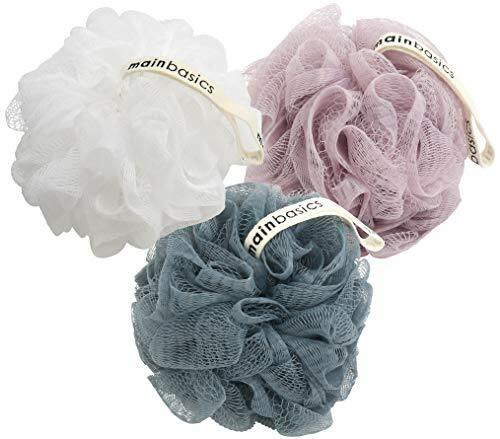 Easy to use: the items have a nice shape and size with a comfortable band and fabric backing designed to ensure the loofah pad stays in your hand. Just soak in water before using. Notice: hand wash only! please replace it every 4 weeks! 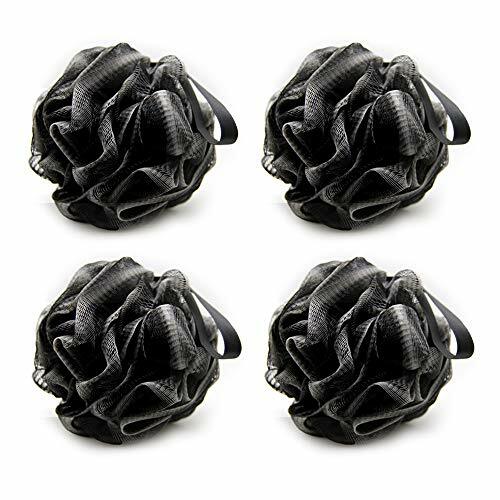 Premium Sponge：Luxury black bath and shower sponge mesh puff with gentle body exfoliating and scrubbing power remove dead skin cells,Colorful for each family members. 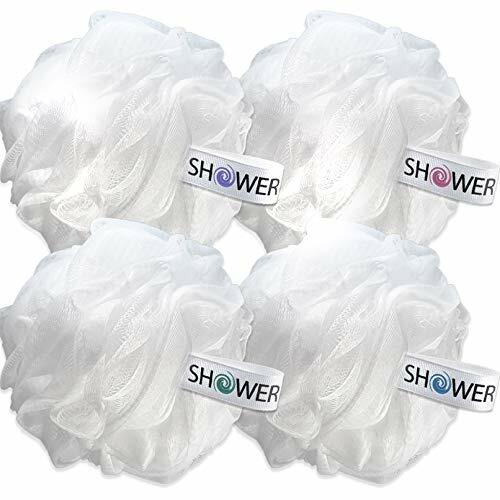 Condition& Material：100% Brand new and moderate price with good quality.It is made from Recycled and Eco-Friendly Materials,Superior size and Quality bath form mounds of suds with soap or shower gel,soft and dense. Daily application：Soft texture,touching smooth skin with a thick bubble,make your shower gels and soaps last longer,and keep skin healthier with daily sudsing and gentle exfoliating using a classic mesh sponge. 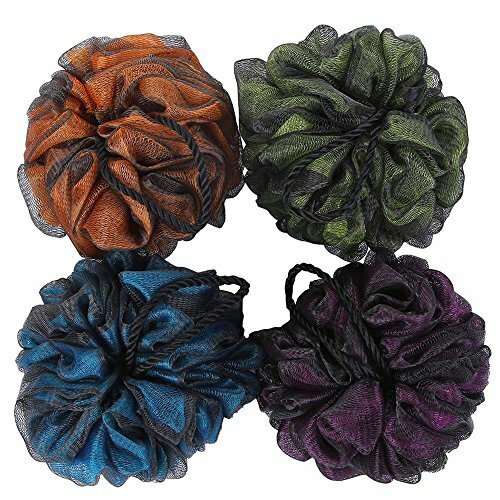 Package includes：60 grams and pack of 4.Palm size and lightweight mesh pouf sponge,easy to use and convenient to carry. 100% Satisfaction Guarantee：In the unlikely event,replace for any quality problem, 100% Customer Satisfaction Guarantee and friendly customer service. ►LOVESTEE'S BATH AND BODY LINE IS MADE WITH A REFINED COCONUT BLEND SELECTED TO CONTRIBUTE BOTH, HEALTH AND BEAUTY. - Start your day right with the delight body gel and bubble bath that will keep you feeling uplifted and perfumed all day! Our Bath salt Soothes and comforts your body, stimulating your senses and brings balance to your moods. ►SUPERIOR TROPICAL COCONUT IS THE SHOW-STOPPING NOTE IN THIS INCREDIBLY LUXURIOUS SCENT. Sultry woods and rich fruit accords help to bring out the skin's natural scent, and the art-deco inspired bottle adds to the fragrance's overall glamour. While our coconut body lotion is easy to apply and absorbs quickly, leaving your skin soft and silky. Lovestee's Spa Gift Set contains good scents that effectively turn your bathroom into a home spa. 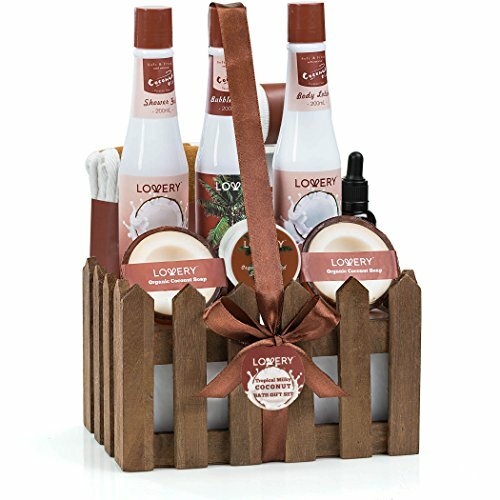 ►THE GIFT YOU'VE BEEN LOOKING FOR- Treat your beloved one with our Tropical Coconut Spa Gift Basket that instills comfort, warmth and serenity. Spark memories and create fun festive feelings of wonderment and merriment. 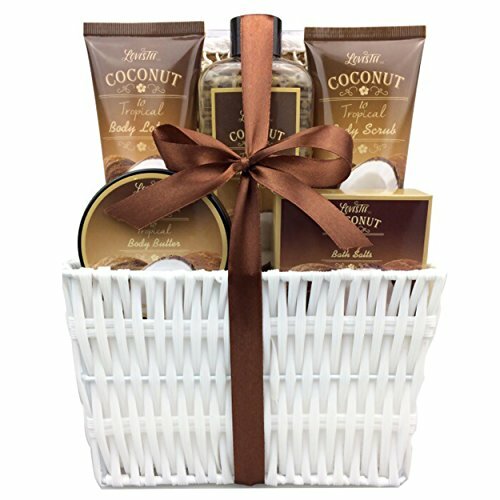 Our Coconut Spa Basket is the perfect gift for Birthday, Mother's Day, Anniversary, Thank You, or for no reason at all. Your gift will leave a lasting impression as they continue to use and enjoy this hand crafted spa basket. Large Size: Full size 4" x 31" with reinforced handles and bar soap pouch. Made from Natural Organic Luffa. Two Sided Technology: one side offers a textured surface that deeply exfoliates; the other side features a soft, smooth microfiber surface for delicate skins. 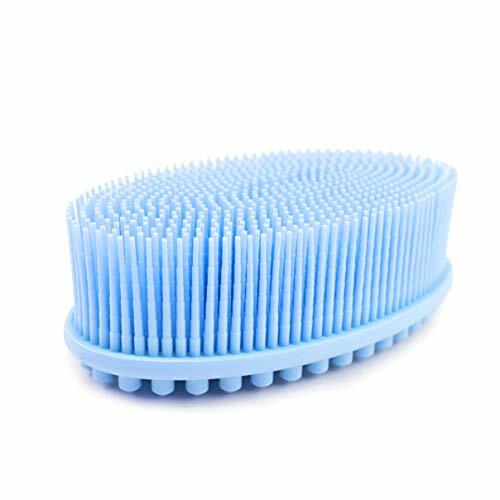 Reveal Glowing Skin from Head to Toe: exfoliating back scrubber is perfect for cleaning the back, neck, shoulders and feet. Fight against breakouts, dry skin, rashes, and other skin problems. Health Benefits: scrubbing your outer skin surface with loofah back scrubber to increase blood flow. In some cases, body scrubber helps you stabilize blood flow. Regular usage of this loofah sponge helps your blood circulation. Recommended by dermatologists and health professionals for all skin types. Clean Easily: convenient handle on each end makes it easy to give your back the attention it deserves. Hang up to keep it dry. 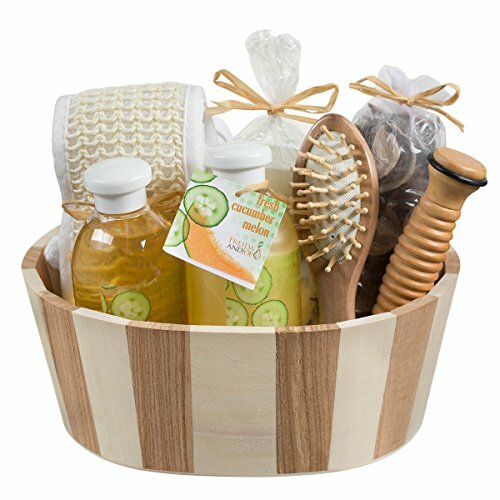 Get this beauty basket as a perfect bath gift basket for women with multiple bath and shower products a cucumber melon massage and reflexology experience you will never forget. LONG EXTENDED REACH HANDLE: Constructed with a durable lotus wood, the wooden handle is over 17" long. The extended handle allows you to clean hard to reach areas such as the back and the feet with ease. Additionally, a textured rubber sleeve provides a comfortable, yet secure, nonslip grip even when wet. Great for exfoliating! Soft to the touch, but rough enough to give you smooth, silky skin! Quality material that looks beautiful, holds up and creates great lather. Large size (50 g), so you can easily hold and scrub. Attractive, longer, durable handle to place hand through for scrubbing and hang to dry in bath or shower. Six (6) beautiful colors (1 of each shown), something for everyone in the household. ★★★Amazon Lowest Price Guaranteed.Same Quality Why Pay More?★★★Exfoliating with a loofah is easy; it takes just a few minutes in the shower and can help make your skin smooth and silky soft.Scrub your body with the loofah and Rinse your skin with warm water.Easily loosen and remove the top layer of dead skin cells. Great size with long handle.The size of our loofahs are perfectly designed which is approx 5.2 inches in width and 60 grams.This environmental and ergonomic design enable you to hold well and wash safe. Hang easily with long handle.Our australian designed loofahs provide 4.7 inches long string strong handles which perfectly fit your bathroom hangers or door hook.Work perfectly with your towel rack. 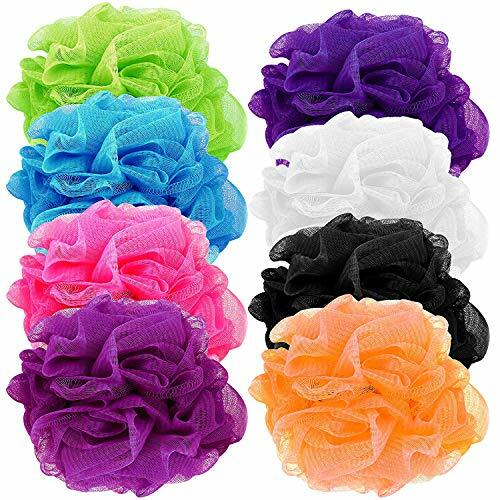 Gift Idea:Our elegant colorful loofahs in 4 is the best choice for you to shop as a present for your family and friends.Lovers will like this definitely.